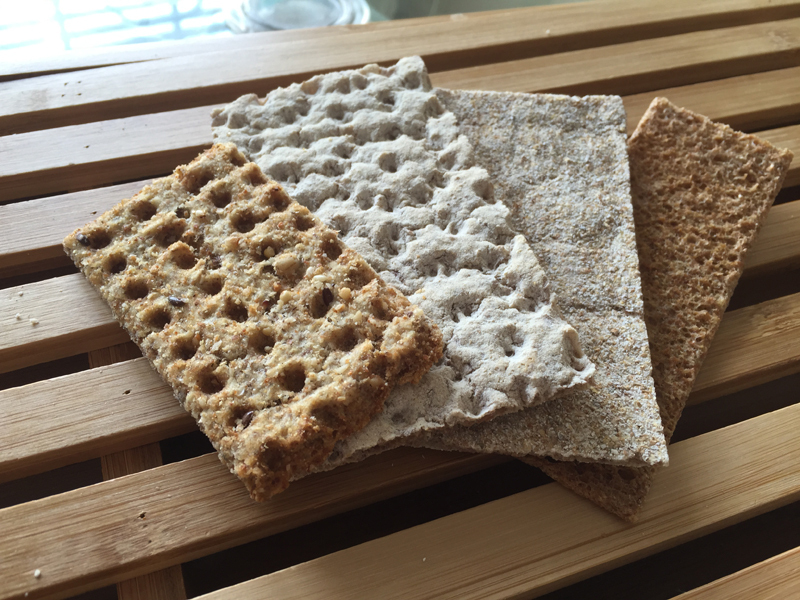 RyKrisp lovers know that it tastes better than competitors like Wasa, Kavli and Finncrisp (shown here left to right). But did you know one of the main reasons why? A major factor is the artisanal approach to preparing the dough for baking. At RyKrisp, we naturally aerate the dough before it is rolled and dimpled to become recognizable as what it is. That process makes the product have a much lighter taste than other crispbreads. You can see it in the deeper dimples and more complex texture. This translates into better taste. When we’re back in the market, we hope you’ll try us again, and note the difference. Thanks very much for putting up this website so I know what happened to my wonderful RyKrisp. Thanks too for keeping the brand alive. Looking forward to getting it back in distribution — would love to see it in Portland, OR at Safeway, New Seasons, and Target. My favorite is the Sesame, next the Seasoned. Ry Krisp had become my “go-to” cracker, replacing lots of other crackers and chips I’ve abandoned. Way better texture and flavor than the other crispbreads. Versatile: as a snack alone; as an open-face “sandwich” with peanut butter & jelly, tuna, any topper; as a crumbled filler in meatloaf; broken into small pieces (easy to break up due to the light, crispy texture) as “croutons” on salads. When it’s back in stock I will buy lots. Best of luck finding and getting a new factory up and running. Susan – thanks for your support for the brand. We’re certainly working on getting production back up and running and will keep posted via the website and other social media as we get to the countdown stage. We very much appreciate the topping ideas. We’d like to come up with lots of new ideas to share. Thanks for the suggestions. Ted Leavitt And thanks for pointing out the error on the contact page! Until this summer I had taken Ry Krisp on all my outdoor adventures since 1986. Now I have to eat Wasa bread, an inferior substitute. I really wish you success in bringing back the brand, and I will be checking my local supermarket regularly. I have looked EVERYWHERE for these crackers. From what I gather, they are no longer available. I drove over 20 miles today (since I’ve looked at WalMart, Target, Kroger, Central Market, Tom Thumb, etc in my area) to my “go-to-Ry Krisp” store in Fort Worth Texas, and NONE!!! When are you bringing them back, and how will we know when and where to get them? As you see from the comments, we are working on it. Taking time, but hope to be back soon. If you subscribe for updates here, you’ll be first to know when and how to get it when it’s back. Thx. I am soooo upset they are not in stores anymjore How can I order?????????????? Just published the latest update. Make sure to sign up for updates if you haven’t already done so. Thanks for the support. Is RYKRISP coming back? Back to Fred Meyer? When? Soon I hope. We’ve been delayed a number of times (due to investments needed to ramp up production), so I am careful with predictions, but I’d say next 6 weeks. We’re probably going to be direct over the internet first and then in the stores. Fred Meyer would be one of the early ones, but no exact timing on any of it. We trust you’ve signed up for updates, so we can let you know when the launch is arriving. RyKrisp crackers are the best made. I have stomach issues and these are the crackers that are the tastiest and easiest on my stomach. I have been eating them since they were first created and got introduced to them by my mom who also loved them. Please, please keep them going! They are by far the healthest, most delicious, and most nutritious snack out there. They are great with an avocado on top, or a bit of salmon, or just plain with butter. Love them! Thanks.